Automotive and Automobile Spare Part Marking. The CR2 is the first all applications barcode reader. Whether you are reading smaller,high density 2-D barcodes or larger low density linear codes,the CR2 will outperform all other scanning devices. 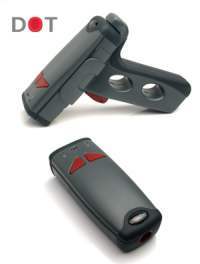 The CR2 incorporates a unique dual path optical system,a 1.3 million pixel CMOS sensor and a 400 MHz processor,and features both a beep and vibrate mode,multifunction LED indicators,two top control keys and one handle (optional) control key. The Cr2 Scans Datamatrix ,QR Code, PDF-417, Aztec Code, RSS Composite and many more 2 Dimensional Barcode Symbologies as well as all linear barcodes. The standard USB interface provides plug-and-play USB HID (keyboard)input for Windows 98,Me,2000 and XP.The RS232 interface supports serial port devices.The PS/2 (keyboard)interface provides plug-and-play support for a wide variety of legacy devices that use the PS/2 keyboard interface, including WIN NT , Linux and Unix platforms. The CR2 sets a new benchmark for size,weight and durability. It is smaller and lighter than comparable systems and features no moving parts,allowing it to outperform all competitive products in drop testing. CR2 is versatile enough for the most demanding applications and will automatically discriminate between all major 2-D and bar code symbologies and features a timestamp feature for logging data. Whether you need a small,palm held device or a traditional gun, the CR2 was specifically developed so users may easily choose the device that best meets their needs.The CR2 features a variety of accessories including a clip-on pistol grip handle,making it is the only product available in handheld, gun handle,and presentation stand for stand alone operation form factors. 1400 mAH or 1950 mAH battery for batch reading using memory. Power Requirements Reader @5vdc (mA)-Typical =140;Peak =310;Idle =n/a; Sleep =3;Bluetooth Radio @90m away (mA)Typical =280 Peak =350;Idle =96;Sleep =3 1400 mAH Battery with radio will support 4000 read/transmits per charge including 8 hours of standby interval.